Nineteen goals to one. That was the story of the second half of Fitzroy’s game against the Peninsula Old Boys at BSO last week as the Fitzroy Senior Men locked in a finals’ appearance for 2018. 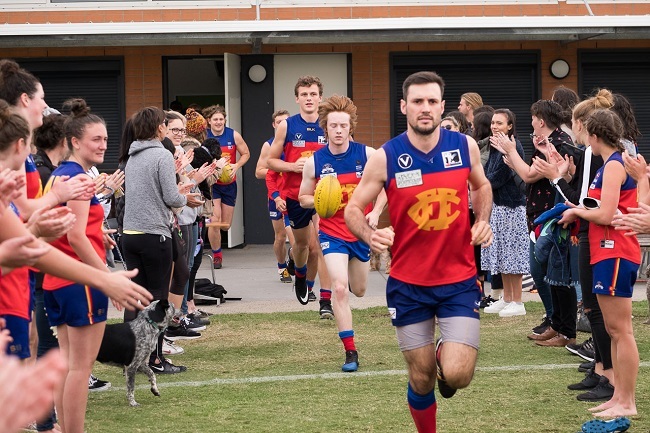 With a large crowd on hand for the Jellis Craig game, the half time margin of three goals and the home side’s inaccurate kicking, meant there were a few nervous moments on the sidelines before the main break. But they were soon put to rest in a blistering third quarter which featured some outstanding individual and team goals. It may have been a restructured forward line that took to the field in the absence of captain Julian Turner, but the inspired move of sending Bill Clayton forward meant that even when he wasn’t getting the goals, he was marking the pill or bringing it to ground. Nathan Jumeau stood up in the absence of his captain and kicked six for the day, with Lachie Henderson using his speed and agility for three and Clayton also kicking three, all in the third quarter. Missing Toby Hudson Bevege from very early in the first quarter, the backline continued their miserly approach to the opposition and Jacob Long absolutely starred in a best on ground performance, teaming well with Tom O’Donnell, Nathan Ligris and Max Ellis, to repel the Pirates again and again, driving the ball into attack. The engine room must also rate a mention, with Rory Angiolella (two goals), acting captain Tom Cheshire and James Butler doing a power of work in sometimes challenging circumstances. Gus Richardson certainly came off second best and he and Rory required some of Phyllis’s best patching up work both during and after the game. The biggest cheers of the day however, came when Matthew Gaite was moved forward and took two strong marks and kicked truly. 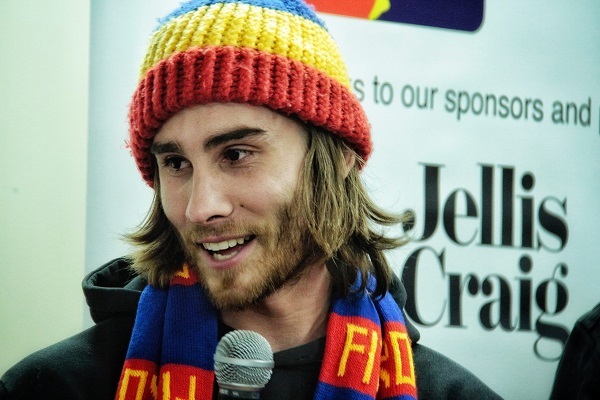 The extra love from crowd and teammates perhaps a reflection on Gaitor’s tough road back from a broken jaw sustained when Fitzroy last played Peninsula. Or perhaps just because he’s just a top bloke! This weekend the team will face another challenge against third-placed Old Camberwell, seriously down on experience, as Turner continues his stint on the sidelines, joined by Toby Hudson Bevege, Tom Biscaro, Tom O’Donnell and Ross Borland, who has headed overseas. Old Camberwell will still be gunning for a top two finish and this is a real danger game. Bringing an experienced head into the side, Will Fenton has been selected, and the inclusion of Sunny Brazier should add some forward line firepower. There are likely to be some interesting indicators as to finals form in the coming weeks, with four of the top five Premier C sides, all coming up against top side Williamstown. Our top performing side, the Fitzroy Reserves, sit atop the Premier C Reserve ladder six points clear and don’t look like letting things slip. The crushing victory over the Pirates started early in the day, but to be fair the opposition didn’t have the full contingent of players to start proceedings and it showed. At the first break, Fitzroy was 24 points up and kept the pressure up all game to get out to an 11-goal lead at half time, which became 22 by the final siren; 23.13.151 to 2.3.15. It was the Will and Will show up forward, with Will Pickering kicking four goals and Will Fenton nailing three. The rest of the goal kicking love was shared around with 12 players kicking goals for the day. Sam Batterton seemed to have benefitted from a few weeks on the sides lines after surgery and was best on ground, with Sean Laidlaw continuing his strong form. This week the Ressies got some special love from the Fitzroy/Carlton AusKick kiddies who played at half time during their game, lining up for a guard of honour to cheer them on and off at half time. The Fitzroy Under 19s have all but kissed their slim finals hopes goodbye after being overrun in the final quarter by Collegians in a see-sawing game at Ramsden Street on Saturday. The Roy Boys made an outstanding start in the first quarter and led 4.3.27 to 1.2.8 at quarter time only to have the visitors kick six goals to one in the second. The third quarter was a really top effort with Fitzroy just sneaking ahead by a point at the break, before Collegians finished the stronger side. 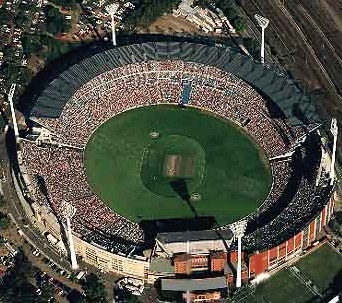 The final score was 11.6.72 to 13.14.92. Rory Patterson, Marcel Laidlaw and Max Tieman were the best players for Fitzroy with Keane Ramshaw and James Wright each kicking three goals. 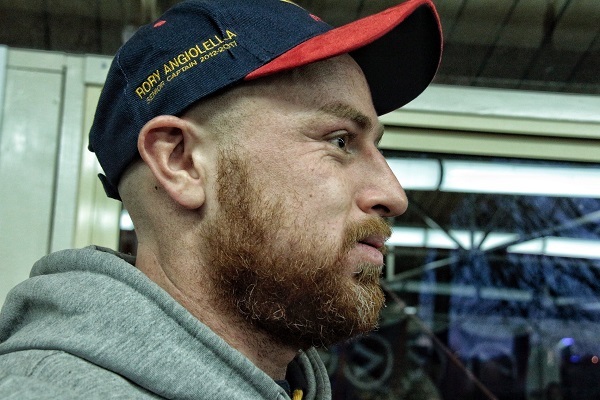 In a brand new tradition, prompted by his long-held desire for a Fitzroy cap, former captain Rory Angiolella has been presented with his own unique model by President Joan Eddy. The cap, complete with his name embroidered on the side, was presented at an informal ceremony at BSO after the game on Saturday. Former co-captain Dan Bisetto and current captain Julian Turner spoke of their love and admiration for Rory as a leader, player and man during the short presentation. All of the past Senior captains since the Reds/Fitzroy merger nearly 10 years ago will be presented with the caps at the final home game on 25 August. 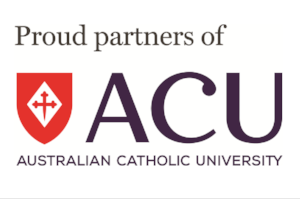 Melbourne University is a very strong football club and the Fitzroy-ACU sides knew they were going to face stiff competition as they headed to the Main Oval at the Uni on Sunday. The Fitzroy-ACU Reserves, who have already secured themselves a finals spot, were under no illusion that this would be a tough contest. 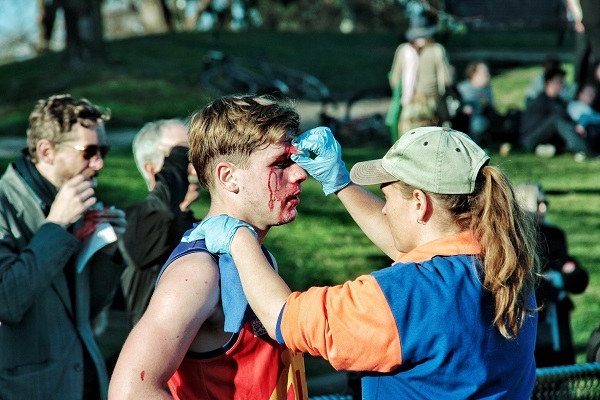 In round one this year, Melbourne Uni kicked off the season with a blistering performance, wining 134 to nil. It is a measure of how far the Roy Girls have come this season, that Sunday’s Round 12 game was a very different story. 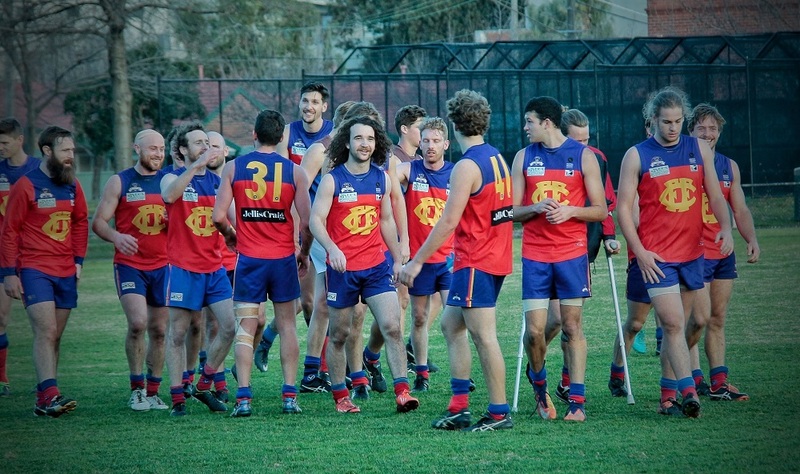 The margin at the end of the day was just four points and it could well be argued Fitzroy-ACU was unlucky to lose. In a low scoring close contest, the visitors came home very strongly and despite much of the play, couldn’t find an avenue to goal against the Mugars’ strong defence. One important thing the Fitzroy side will take a way is the importance of being ‘on’ from the first bounce in what are often low scoring contests. If it weren’t for two early goals to Melbourne, the story may have been very different. The quarter time score was 3.0.18 to 1.1.7. The final score was 3.1.19 to 2.3.15. Tess Plant-Thomas (otherwise known as Lettuce) continued her outstanding form and was best on ground, also kicking the side’s two goals. Emily Fitt and Jess Ashcroft also performed strongly. Fitzroy-ACU Seniors will unfortunately miss finals this year for the first time since their inaugural season. This was another game where perhaps the final score didn’t reflect the closeness of the paly. But in the end, the class and finishing of the Melbourne Uni side showed why they are the equal top side in the Premier Women’s competition and probably premiership favourites. 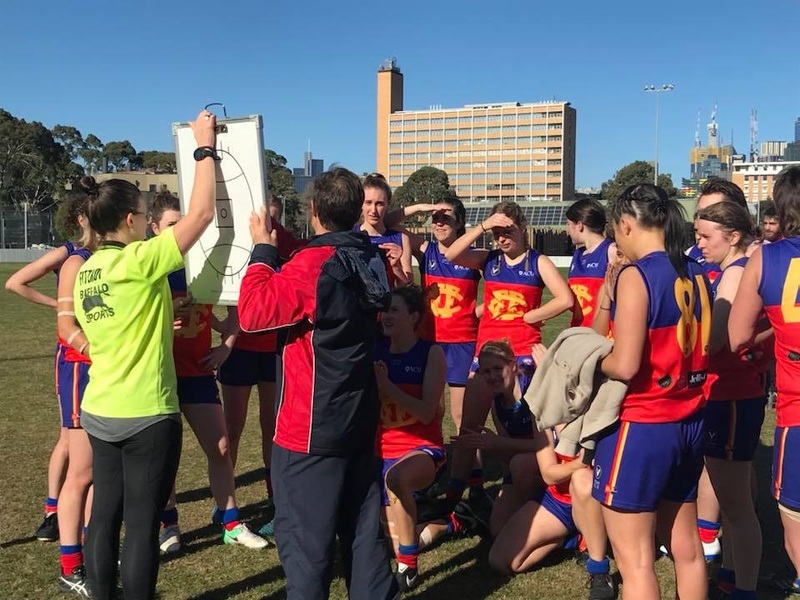 The tackling of the Fitzroy-ACU women was again a feature of the game but the inability to get on the scoreboard meant they didn’t take advantage of turnovers. 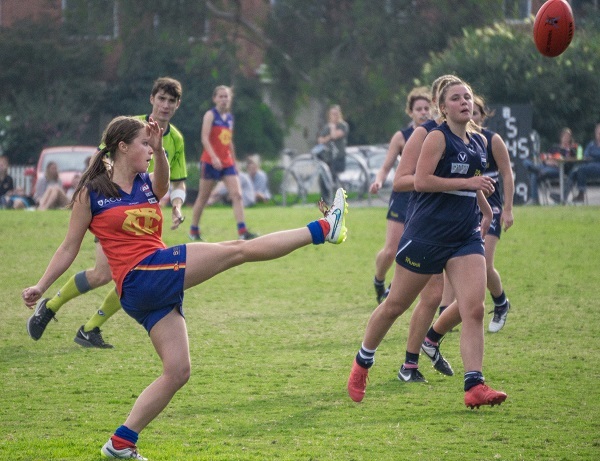 Melbourne’s defence was excellent, and the Fitzroy team sorely missed injured goal kicker Ruby McDermott. The inclusion of Collingwood-VFLW listed player Paige Nash for her first game proved a major boost and she finished in the best players and kicked one of Fitzroy-ACU’s two goals. Alongside Nash, there were consistent and strong performances again from Erin Gogerly (with a great goal on the run bringing supporters to life in the final quarter) and Lucy Kerr, who still made an impact despite a close tag. The senior girls gave it everything, but in the end went down 7.3.45 to 2.5.17 with all eyes and efforts now going into finishing the season strongly and helping the Reserves gain what could well be a home final at BSO on August 4 if they can secure third spot. They may not have taken the points, but Luci Murphy and Claudia Bell entered and exited the arena in style at the Melbourne Uni on Sunday. The two celebrated their 50 game milestones, bursting through the traditional red banner and were chaired off like Queens at the end of the day. It was a bittersweet moment but like they always do, the Roy Girls kept the fun in the game. 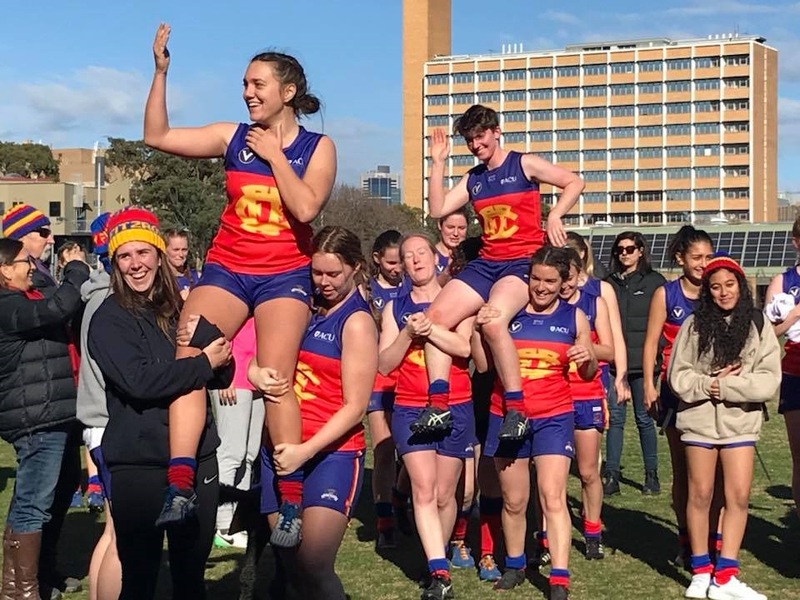 Alice Batterton goes about every game in her no-fuss, uncompromising fashion and this Sunday against Old Xavier will be her 50th appearance for Fitzroy-ACU. Having played her 50th last week, teammate, friend and vice-captain Luci Murphy penned a heartfelt message for Batts. “It has been an absolute pleasure playing with Batts these past four years. Watching her develop into the highly talented and reliable player she has become today, it is a real testament to her dedication and skill. “Although Batts is known for her incredible tackling pressure, her presence off-field is also an asset to the club. She is a very caring team mate and has a delightful sense of humour. She is inclusive, compassionate and her quick wit helps make footy fun,” Luci said. “A quiet achiever who wears her heart on her sleeve, Alice is a great footballer and Fitzroy is lucky to have her. I feel privileged to run out alongside her this weekend, and hopefully many weekends in the future. You can’t say better than that. Congratulations from everyone at Fitzroy, Alice. Thirds captain Tim Denatris has gone to second on the Thirds goal kicking ladder, just five off the lead, after the Thirds 212-point demolition of an undermanned Caulfield last week. The home side didn’t have a bench at Glenhuntly Oval and the Thirds, well in the race for a top four finish, decided to put the foot down and build percentage. Two weeks after he’s kicked a bag of six, Denatris kicked nine goals against Caulfield and even then copped a ribbing from his teammates for missing what should have been an easy 10th from the goal square. Joining Denatris in the goal feast was Harald Jorgensen with six and Tom Marchesani with three. The win puts Fitzroy into third position on percentage with three games to play. This week they play second placed Beaumaris and next week it’s a huge contest against Williamstown, who are currently one game behind but with a far superior percentage. It’s exciting! Go Roys! Leadership and resilience can come in many different forms and our guest speakers for the next pre-game lunch on August 11 will discuss what they’ve learnt from facing life or death challenges and a whole lot more. Dan Cairnes, a local and an ex-Army Officer who served in Iraq and Dave Farrell, a leadership coach, who was part of the Army’s elite Special Air Service Regiment, are our guest speakers at the next Fitzroy pre-game lunch. With a keen understanding of the challenges facing Veterans when it comes to settling back into day-to-day life, the pair have established Veterans in Construction to assist with the transition. Their themes of leadership and resilience are just as pertinent to football and life. 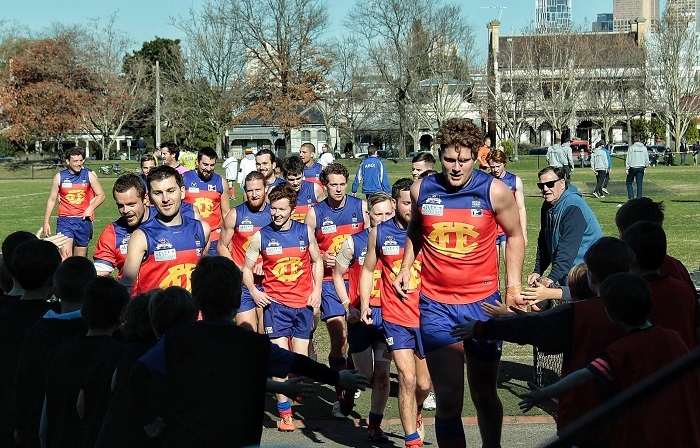 Join Dan and Dave for a fascinating insight into military and post military life before Fitzroy takes on Old Ivanhoe in the Round 16 game at Brunswick Street Oval. 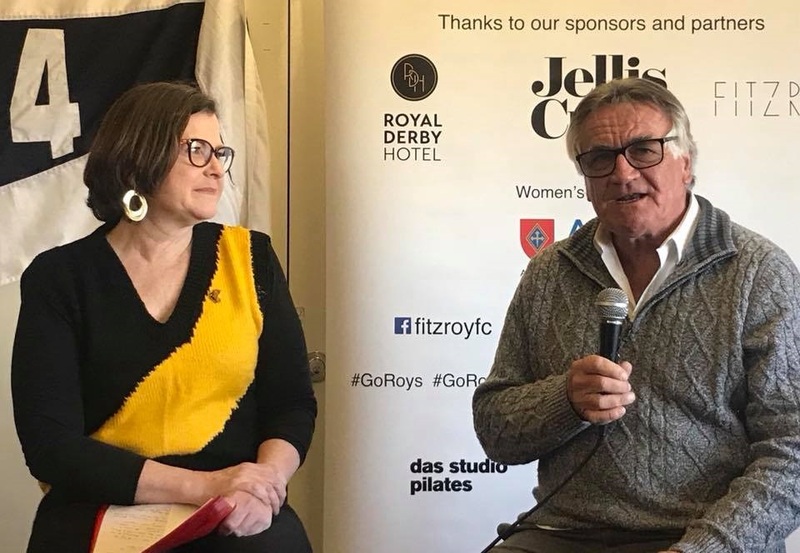 It was another sell-out lunch last week as the ABC and Fitzroy’s Richard Willingham posed both the sports-related and the tougher political questions to Reds Foundation guests Ged Kearney and Barrie Cassidy. Ged impressed footy fans with her hand-knitted Richmond jumper, tales of drinking from the AFL premiership cup as a small child and having a statue of Dusty in her office in Parliament House! 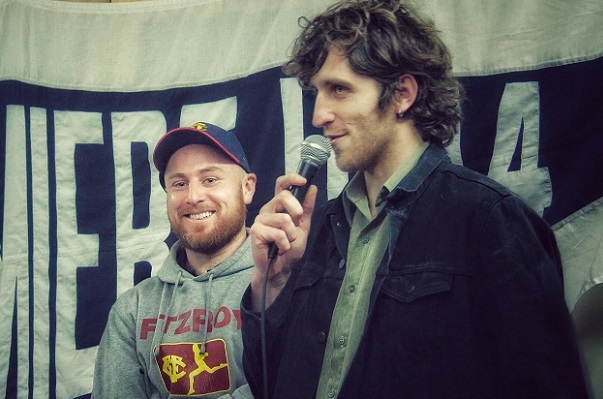 Barrie told us about his start as a country sports journalist at age 15 (or was it 13?) and being able to tell the fake from the real footy fan in the world of politics. As is the magic of the community rooms at BSO, the honest commentary seemed to flow from there. King George was on hand and although he didn’t get to ask his well-planned question, he did provide a great overview of the day at BSO for The Footy Almanac this week. 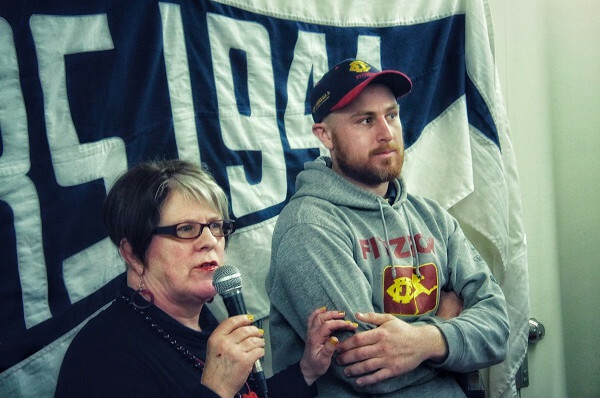 This year the Fitzroy Junior Football Club celebrates its 25th year and has issued an invitation to all former players and associates of the club. If you are keen to get back together with old team mates and current junior club reps, make sure you book in for the Fitzroy Idol celebrations on Saturday 28 July at the Thorbury Theatre. Join Joan Eddy, Sam Buckley, Rich Willingham, Rory Angiolella, past Presidents Michael Wright, Jeff Richardson, Steve Turner and Mark Buttifant, past administrators, past coaches, past players, past volunteers, past friends…all not forgotten. 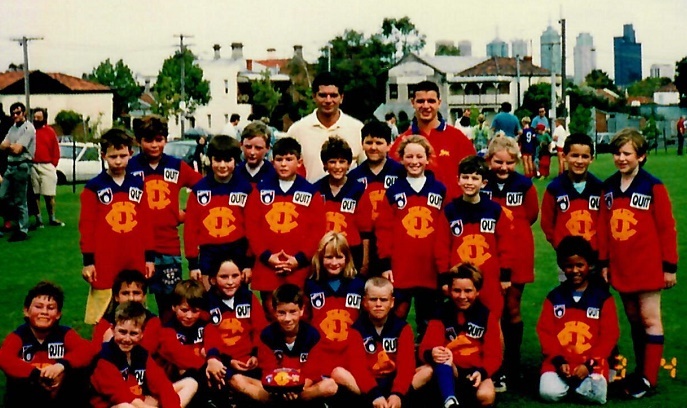 Do you recognise anyone from this 1993 Under 11 team? A huge thank you to Ellen Makridis and her family who put an enormous effort into organising and running our annual afternoon tea last weekend. The spread had to be seen to be believed and the Ressies boys certainly thought all their Christmases had come at once. What a feast we all had. The sugar levels during the third quarter perhaps adding to the on-field excitement. 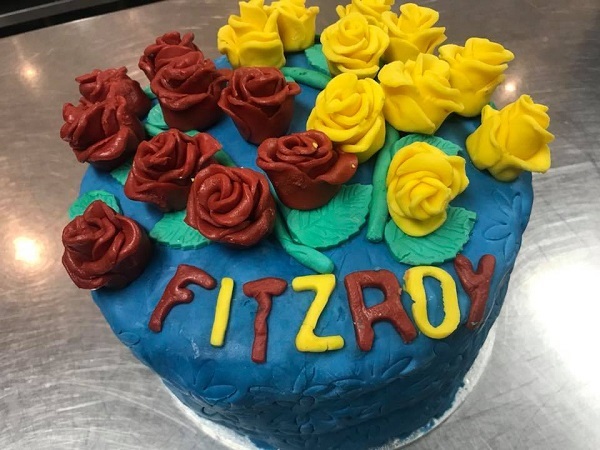 The incredible Fitzroy cake baked by Louise Maniatakis was almost too good to cut. Thank you to everyone who made cakes, came along and joined in the fun. We may be biased but we think our unofficial VAFA number one afternoon tea reputation has been upheld, not that we’re competitive at all. 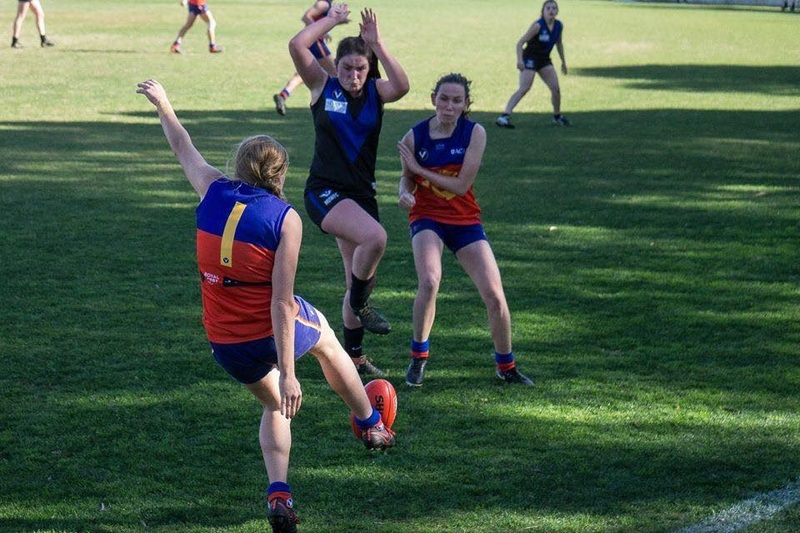 Old Xaverians vs Fitzroy-ACU Women’s Seniors – VAFA Premier Senior Women’s – Xavier College, 1.00pm, Sunday 22 July.